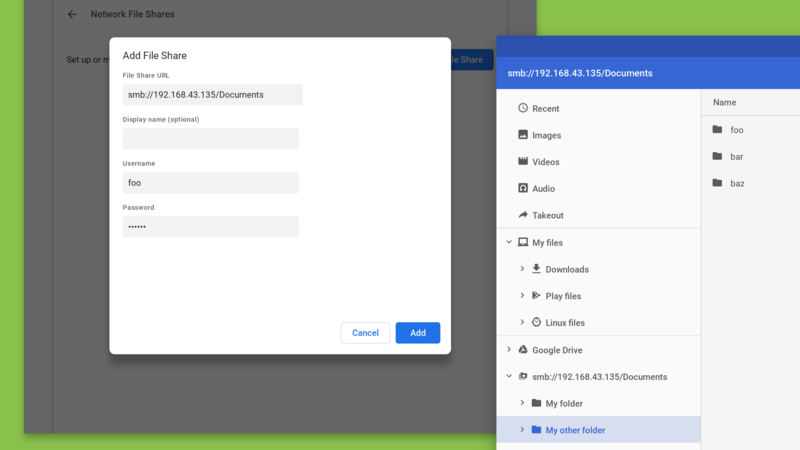 Something to look forward to: In an effort to make Chrome OS more useful to Windows aficionados, Google is adding native SMB file sharing support. This continues Google's efforts to make Chrome OS more appealing to Windows power users. Coming soon to Chrome OS will be the ability to enable native file sharing and network browsing to Windows machines. Users will be able to add the network share to the Files app and look through files as if it were directly connected to Chrome OS itself. "Network File Shares (such as Samba) are now enabled by default in Chrome OS Canary. This means you can browse another machine folder quite easily once it's set up," explains Google's Francois Beaufort in a Google+ blog post. Currently, the only way to access an SMB file share is to install a Chrome extension that uses Samba to set up the connection. Google is trying to make this a native feature and hopefully make it easier for people to switch completely from Windows to Chrome OS. Many people use network attached storage (NAS) devices at home or at work so the ability to add SMB shares natively instead of using an extension (that's prone to dropping connections according to the reviews) could be very useful for many people. This represents an important step in Google's attempts to drive people away from low-cost, low-power Windows laptops to Chromebooks. The education market is already filled with Chromebooks while both Microsoft and Apple are actively trying to steal away market-share. However, adding more power user features to Chrome OS could go a long way in siphoning those users away from traditional operating systems. Windows analyst Paul Thurrott noted that this feature is set to release on Chrome OS version 70, due out October 23rd.